AI, data and cloud are ushering the next wave of transformative innovations across industries. With Azure AI, our goal is to empower organizations to apply AI across the spectrum of their business to engage customers, empower employees, optimize operations and transform products. We see customers using Azure AI to derive tangible benefits across three key solution areas. First, using machine learning to build predictive models that optimize business processes. Second, building AI powered apps and agents to deliver natural user experience by integrating vision, speech and language capabilities into web and mobile apps. Third, applying knowledge mining to uncover latent insights from documents. Today, at Microsoft Ignite, we are excited to announce a range of innovations across these areas to make Azure the best place for AI. Let me walk you through them. From pre-trained models to powerful services to help you build your own models, Azure provides the most comprehensive machine learning platform. To simplify development of speech, vision, and language machine learning solutions, we provide a powerful set of pre-trained models as part of Azure Cognitive Services. When it comes to building your own deep learning models, in addition to supporting popular frameworks such as PyTorch and TensorFlow, we have worked with Facebook to co-develop ONNX (Open Neural Network Exchange) that enables model interoperability across frameworks. We offer a choice of Machine Learning services with Azure Databricks, Azure Machine Learning and Machine Learning VMs so you can apply machine learning at any scale. To help you build and train models faster, we provide distributed deep learning capabilities over massive GPU clusters. You can also access powerful hardware (FPGA) accelerated models for very high-speed image classification and recognition scenarios at low cost. Once you have built your model, you can deploy on-premises, in the cloud or on the edge, including offline environments. Today, we are announcing several updates to Azure Machine Learning, available in preview. Automated machine learning and hyper-parameter tuning to help you accelerate the rate of model development by identifying suitable algorithms, features and ML pipelines faster. Distributed deep learning to enable you to develop deep learning solutions faster with massive, managed GPU clusters. Hardware accelerated inferencing for high speed image classification and recognition scenarios using powerful FPGAs. Supported models include ResNet 50, ResNet 152, VGG-16, SSD-VGG, and DenseNet-121 that can be trained using your data. A new Python SDK to enable you to access Azure Machine Learning from your favorite Python development environment, including Visual Studio Code, Visual Studio, PyCharm, Azure Databricks notebooks, or Jupyter notebooks. Model management capabilities to help you manage you manage Dockerized models using models and images registry that integrate into your continuous integration (CI/CD) pipeline. 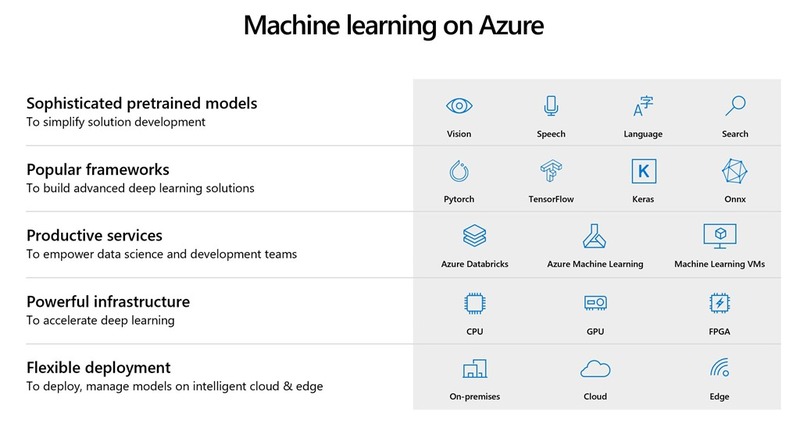 “By using Azure Machine Learning, we can meet a variety of customer needs, learn from all the analytics, and put that learning into new products and services to improve our offerings”. Additionally, Content Moderator, Computer Vision, Face, Text Analytics, Translator Text, and Language Understanding APIs will be generally available in US Government regions in the next few weeks. Microsoft has reached another AI milestone in text-to-speech synthesis with a system that uses deep neural networks to make the voices of computers nearly indistinguishable from recordings of people. This capability is available in preview through Azure Cognitive Speech Service and you can sign up for access. We have a number of customers such as Progressive, Dixons Carphone, UPS, Progressive and Adobe building AI powered apps & agents. Organizations have valuable information lying latent in historical records across multiple data formats that are difficult to explore such as forms, PDFs and Images. Unfortunately, this information is hidden, not searchable and hence not useful. 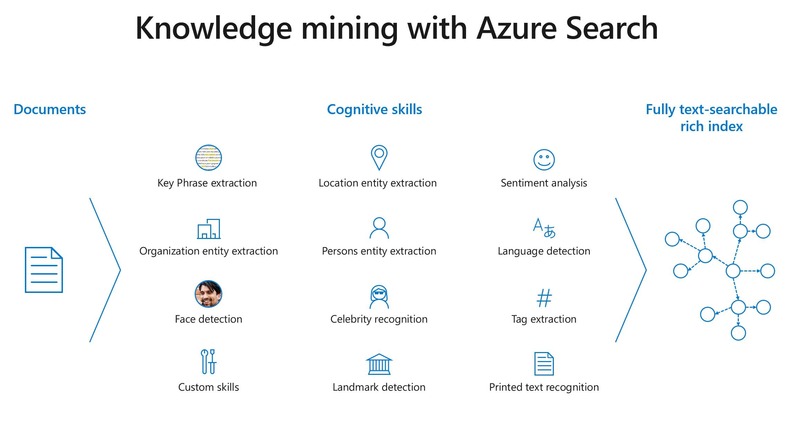 Azure Cognitive Search (in preview) adds Cognitive Services on top of Azure Search, helping you glean knowledge from vast amounts of data. With Cognitive Search, you can easily add object recognition, computer vision, entity extraction and other cognitive skills to explore various data types and then bring all the output together to uncover opportunities. Since announcing the preview of Cognitive Search at Microsoft Build earlier this year, we have seen rapid adoption, with tens of millions of documents getting processed every month. “Azure Cognitive Search has helped us deliver an intelligent, easy-to-use platform to our customers that surfaces actionable insights from tons of unstructured data – using entity recognition, language translation and other cognitive capabilities”. As we continue to make Azure the best place for AI, we are most excited to see what customers can do with AI. The opportunities are limitless, and we are looking forward to seeing what you create with Azure AI. Get started today.